Still, Moon bears some share of responsibility “for the schism,” said JoongAng Daily (South Korea). 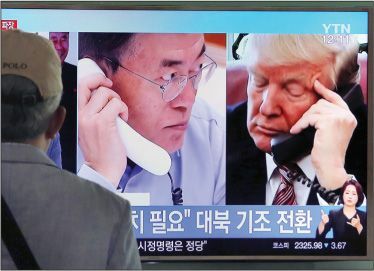 After Pyongyang threatened to strike Guam, Moon declared that no one could take military action in the Korean peninsula without Seoul’s consent—implying Trump should ask Moon’s permission before retaliating against an attack on U.S. territory. Moon’s insulting manner contrasts with that of Japanese Prime Minister Shinzo Abe, “who is in constant communication with Trump.” Abe is doing his best to steady Trump’s “unstable” foreign policy, said the Asahi Shimbun (Japan). He wants the U.S. to pressure China to cut off North Korea’s oil supply, which might force dictator Kim Jong Un to rejoin international talks on his regime’s nuclear program. But Trump has done so in the least diplomatic way possible, by threatening to stop all trade with China if it refuses to crack down on Pyongyang. Washington needs to learn that it “does not hold absolute authority over the world,” said the Global Times (China). Starting a trade war with China is impracticable, because it would cause “a much worse crisis” than the North Korean showdown. And threatening Pyongyang with military action won’t intimidate Kim: He knows the U.S. won’t follow through because a war in the peninsula would cause unacceptable devastation. Washington should accept China’s “dual suspension” plan, whereby North Korea would halt nuclear and missile tests if the U.S. and South Korea suspended joint military drills.